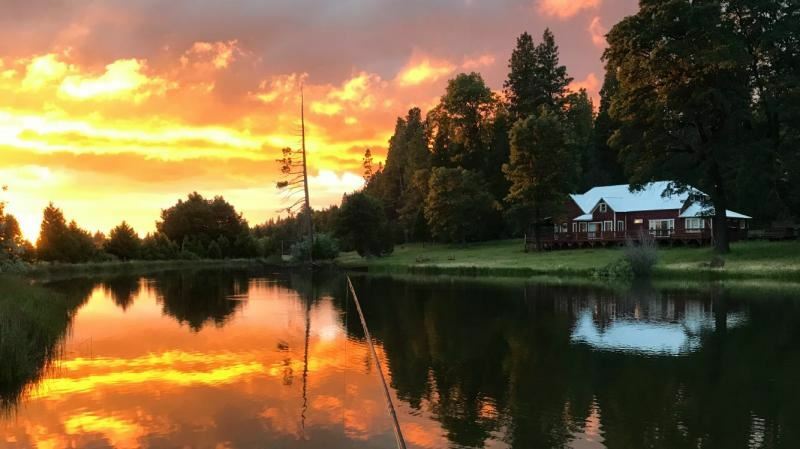 This premier private water venue is nestled on the slopes of Mr. Lassen and with the record breaking snow pack that will provide chilly water all summer long, which is crucial for the trophy sized rainbows; with their beautiful coloring, and the gorgeous browns that inhabit the lakes. The ranch is perfect for every level of angler(s), heck while individual watercraft's and waders are not allowed, which is good. The lakes can be easily fished from shore making the trip even easier…just you, your partner(s), your rod and some flies. There are even nets available for your use. The lakes can accommodate up to 10 anglers per day, remember, when you book Digger Creek Ranch it is yours and yours only. There will not be any others while you and your party are there. You have complete privacy!! The lodge, which sleeps up to eight, includes a gourmet kitchen, restrooms, large living room, four bedrooms all with their own private bath along with satellite TV and a wraparound deck with a BBQ for your use. The property can be self-guided or you can have the services of one of our very knowledgeable guides to help you hook and net your fish of a life time! The upper lake is right outside the lodge and offers sight fishing with dry flies or indicator fishing. The second lake is a short drive down the property. This is a deep lake for streamer fishing and gets much less pressure. The lodge has 4 bedrooms with 4 ½ baths. There is a gourmet kitchen with several large tables. There is a firepit between the lake and the lodge. Gas and charcoal barbeques. 5 wt rods are good with floating and sinking lines.